The terms, and markings on this page are only a small amount of things you may encounter in music. Compiled here are some basics that are printed in stringed instrument repertoire. Spiccato - Off the string. Controlled bouncing short strokes. 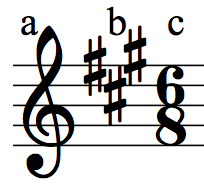 a - Clef - Treble, Alto, and Bass are the most common. b - Key Signature - The Sharps, or Flats at the beginning of a line of music. 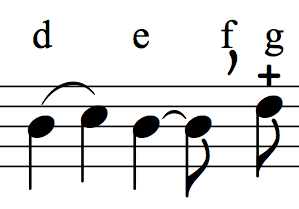 c - Time Signature - The two numbers at the beginning of a piece of music that denote how many beats there will be per measure (Top number), and what note will equal one beat (Bottom number). In the example there will be six beats per measure, and an eighth note equals one beat. f - Breath Mark/Bow lift - Many students first learn that this mark means 'bow lift' or 'circle bow'. This is not always the case. This marking is a 'breath mark' and when it is in a piece of music, but nothing indicating that a down-bow follows the performer takes a pause as if he/she is taking a breath. g - Left hand Pizzicato - using the left hand, usually the pinky, to pluck the string.